Textile art by Oxfordshire WI, depicting viruses and diseases. Oxfordshire's Women's Institute groups use their vast range of handicraft skills to portray dangerous viruses in the 30 panels, designed by textile artist Anne Griffiths, on display at Science Oxford, on St Clements. 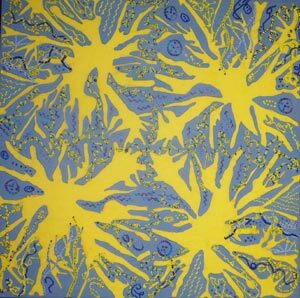 The deadliest of viruses are represented with contemporary textile techniques such as the lace effect of free machine embroidery to create 'Spongy Brain', a symptom of BSE. Flat silky red and black seminole patchwork shows a 'DNA fingerprint', just one of the many works that celebrate the building of a new super microscope at a Harwell research centre. 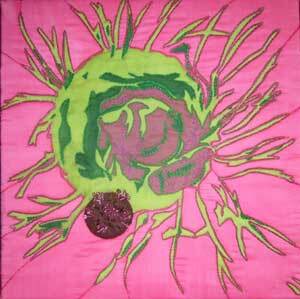 'Breast Cancer Tumour' shows gloopy bubbling pink cells and 'Malaria' is an appliqué work in purple; showing how diseases have become associated with a colour. The WI groups and Research Scientists collaborate to offer a clever combination of craft, design and science. The knitting in 'Chromosomes' represents the process of how nature packs a lot of DNA into a small cell nucleus. Scientific symbolism spills over into the textile panels. 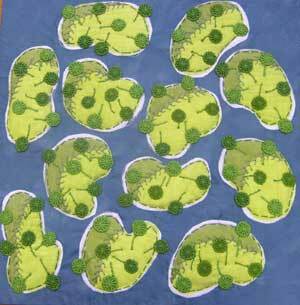 Dorset buttons represent the receptors that 'Flu Virus' uses to attach to cells. 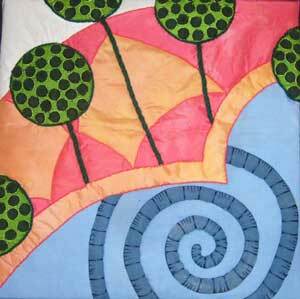 Large round fabric patches, in primary colours, show the atoms in 'Molecular Structures'. Glorious golden colours of plush velvet show puffy round 'Pollen Grains', reminding the viewer that the agents this work represents can cause misery. The new 'Diamond Light Source' Synchotron microscope will no doubt create equally beautiful images using electrons instead of light to produce a 'Diffraction Pattern' such as the one displayed, with concentric yellow stars arranged in a kaleidoscopic effect.